FLASH: Cecilia gets an auto qualifier at USATF tonight in Sacramento placing 3rd in her heat with a personal best of 2:02.14. "This was a phenomenal performance in a season of phenomenal performances. Not only was it a PR of 1.7 seconds, the tactics were perfect," noted Coach Jerry Alexander. "Cecilia was in last at the 400, and closed faster than anyone in the race. To make her run all the more remarkable, Cecilia has been dealing with a hamstring strain that has prevented her from running for almost two weeks." GRC athletes put in three big performances today at Grandma's Marathon and Gary Bjorklund Half Marathon in Duluth, Minnesota. Minnesota native Evan Jurkovich notched a three-minute PR with a 2:27:37, good for 43rd place. Jurkovich closed well, moving from 69th place at the 10k to 55th at the Half. His splits were generally even and he held firm during the last 10k. 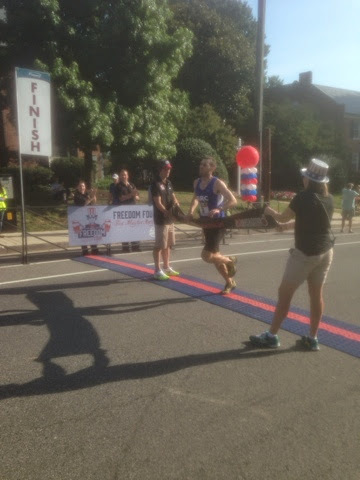 Luke Meyer hit 1:05:33 in the Half, which placed him tenth. Kieran O'Connor scored a one-second PR for 1:05:58, good for 14th place. These solid performances put the runners just a skip away from the Trials standard. Ex-pat Benedict Sloane, who, rumor has it, is pulling for Portugal in the World Cup tomorrow, stayed relaxed for a 1:10 or so. As is tradition, we will run from the store tomorrow morning and do a "course inspection." This means we'll clean up any debris that might be littered on the course, etc. Meeting time will be 8:00 (earlier than usual!). Let us know if you plan to attend. Congratulations to Cecilia for achieving the USATF A standard! On Saturday Cecilia won the 800 at the New Jersey International Track meet in 2:03.87, which qualifies her for the USATF championships in Sacramento at the end of June. And to cap off her night, shortly after the race Cecilia was invited to run in the Diamond League meet in New York on Saturday. No, I'm not kidding--she's running well enough that she has the opportunity to race against a world class field. The fact that she has gained that kind of visibility, while training alone and competing in an event in which she had minimal experience before this season, is truly amazing. It's been a whole lot of fun for me to watch Cecilia's development this spring, and considering that she has improved her PR by a full second in the last 8 days, I can say with confidence that she will make some noise at nationals! Check out this excellent piece on Ivy League alums running for GRC.